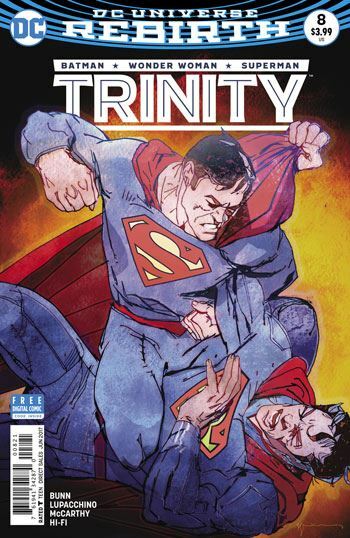 I can’t say this was my favourite issue of Trinity. Issue 8 is basically a set up for the conclusion of Rebirth, as Superman shares the events of Superman Reborn with Batman and Wonder Woman. Since the three heroes do little other than converse through the issue, visual dynamism is added by Superman relating a dream he had, which put Batman and Wonder Woman into a big battle between the two Superman. The fact that Superman has been dreaming about Batman makes Bruce Wayne very uncomfortable, which is kind of funny. The writing of the issue is good, so far as characterization goes. Wonder Woman is far more understanding about the unbalance Superman feels after learning that he is not exactly who he thought he was, and that his reality is being played with. She alludes to events taking place in her own book, and having her own reality toyed with. There is a great double page spread of many incarnations of the three heroes, as Superman makes reference to the Multiverse. 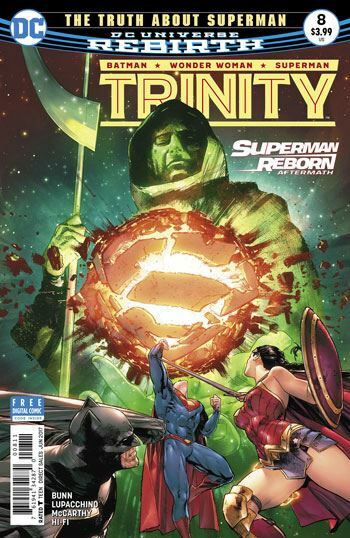 The conclusion of the story brings back the mysterious cloaked figure central to Rebirth. All in all, not a great issue. Filler and build up more than anything else. But it is pleasantly executed.